I recalled that Monday night 12/07/09 on my way home from Rite Aid, where I’d had to go buy a few things. I was having pretty severe pain in lower left abdomen, after having had several “difficult” eliminations earlier in the day. I took the pain for infection-inflamed ureter; later concluded I was passing a stone. Long time since I’d passed a stone. Long time by my standards, that is. The state I was in at that hour, I was inclined to cancel all appointments and errands for the next day, and plan to spend all day Tuesday flat on my back in bed. With pain like this, you can’t do much more than just stare into space and feel miserable. I would recall one author’s answer to Dad’s argument; Lawrence Althouse is the guy’s name. He said the sheer alleviation of pain — without opiates — is justification enough for the practice of spiritual healing. Pain occasions loss of productivity, as just described. It also stresses relationships; with any less self-control as to these things than I’ve learned in the past few years, had anyone crossed my path the wrong way on that trip home, I might well have snapped at the person. That’s not something you want to do in the ghetto. Especially at night. There are other was to effect spiritual healing, besides prayer. Just being nice to people, as opposed to choosing, say, to inject needless pain (“static”) into their world — that’s one. Crystal happened to wait on me at the Rite Aid; she’s my favorite clerk, and I’d not seen her in months. Damn if she didn’t smile at me and give me a cheery greeting as soon as I came in the door. Damn if my pain didn’t go away — completely — for some time, later after I got home, as I recalled that encounter. “Spiritual” — healing — indeed. Every word can work good or ill. My choice; your choice. This conversation yesterday with a co-worker astonished me. “Peaches” is a 42-year old, very short woman, certainly a grandmother and very likely great-grandmother, who has about half her teeth. She works principally as a cashier, and is a really good worker and co-worker. She constantly teases me by pretending to flirt with me. • Rationalism cannot save us. • Hell has an exit. 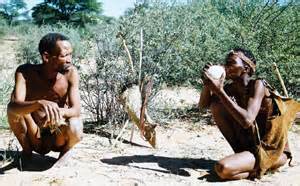 The Khoisan have never left the Stone Age. Neither have we. All it needs now is an appearance on Dr. Oz. How can any trendy, with-it person fail to be atheist? In a blog post of July 19, 2014, I declared my ambition to become the “Nemesis of the morning glories” in the garden out behind my church. My plan was to spend four hours per week specifically weeding the morning glories in that garden. Heather Cook, an Episcopalian suffragan bishop in Maryland, has been in the news lately. A few weeks ago, she was involved in a vehicular homicide, and currently faces charges including vehicular manslaughter, driving while intoxicated, texting while driving, and leaving the scene of an accident. The most recent terrorist threats we’ve seen have come not from Muslims overseas or Muslims in this country, but from Christians in this country. On January 14, Duke University announced its plan to broadcast the Muslim call to prayer from the tower of its chapel every Friday. Franklin Graham posted on Facebook, requesting that donors withhold donations to the university it reversed that decision. A firestorm of controversy followed. In the January 13, 2015 Washington Post, Valerie Strauss calls attention to an obscure Supreme Court case that she says may have a greater impact on the educational achievement of black children than any other case since the 1954 Brown v. Board decision. She republishes a lengthy analysis of the situation by Richard Rothstein. She often republishes Richard Rothstein’s articles. As usual, Rothstein has assembled a mountain of data in support of his position; however, unfortunately, a mountain of data matters little if one’s premises are wrong. My second audition file. The sound quality isn’t perfect, but I adjudged not bad enough to prevent posting here. December 2014 saw a splash of anti-Christian pieces in the media. There was Kurt Eichenwald’s January 2 Newsweek cover story, which I need not respond to; an adequate response has already been made by Albert Mohler, M-O-H-L-E-R. There is Steve Siebold’s December 24 HuffPost article, entitled, “Don’t Just Question the 10 Commandments; Question the Entire Bible.” I may respond to that at a later date. And then there was Jeffrey Tayler’s December 22 Salon.com piece, entitled, “Let’s Make Bill O’Reilly’s Head Explode: We Desperately Need a War on Christmas Lies;” to which I will respond now. Here is my first audition file. The sound quality and performance aren’t the best, but I’ve chosen to post it anyway given the weight of the subject matter. I need to show that I can speak off the cuff about current events, and an opportunity to do so came in the controversy over recent tweets by Maria Chappelle-Nadal. I’m not concerned about victimizations that occur when blacks “act white” in the presence of whites. In my world, there aren’t enough white people to matter. I’m concerned about the victimizations that occur when black people “act black” among blacks.